With 187 pages of essential information and colour photographs, the Growing and Knowing Flowering Bulbs ebook is a handy reference for home gardeners, horticulture students, professional horticulturalists,nursery workers and anyone with a love for flowering bulbs. This ebook has been written by John Mason and Staff of ACS Distance Education. 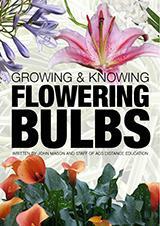 Learn to grow flowering bulbs for pleasure or profit. Bulbs are grown in home gardens in just about every place that people live. There are bulbs that grow and flower on the equator; and others that can perform well in places like Alaska and Iceland. Learn which bulbs grow best in which locations (hot, cold, dry or wet, sunny or shaded). The beginning of the book helps you understand different types of plants that are commonly called bulbs (true bulbs as well as well as corms, rhizomes and tubers). Explore how bulbs are cultivated and propagated, where they can be used in a landscape, and what bulbs flower at different times of the year. The ebook also contains descriptions and photographs of different types of bulbs. This information provides a unique reference to help identify and understand each of the 74 different types of bulbs covered. Each genus is presented with details that explain where it originates, what it looks like, how to care for the plants, how to propagate them, where it is used (eg. In the landscape or as a cut flower), and what (if any) health issues it commonly encounters.